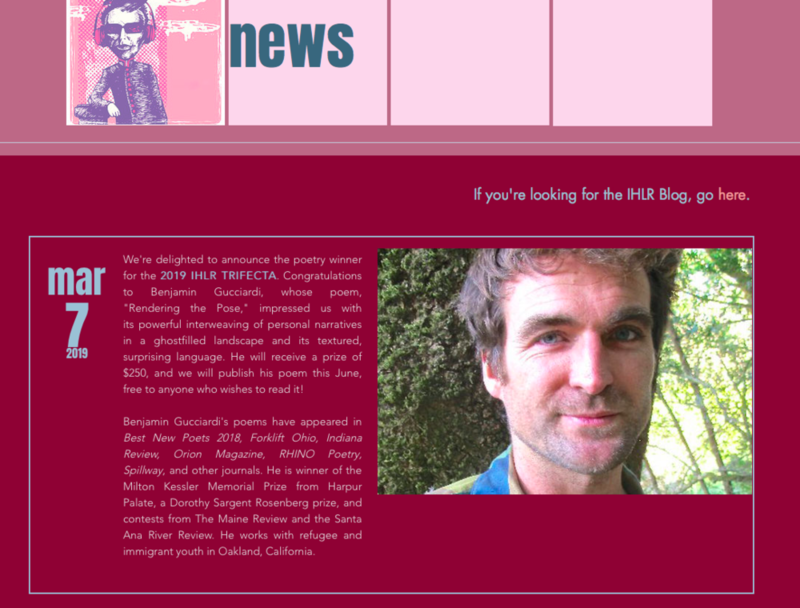 I am very grateful to the editors of Iron Horse Literary Review for selecting my poem “Rendering the Pose” as the winner of the 2019 Trifecta poetry contest. Poetry Editor Geffrey Davis’ book Revising the Storm from BOA Editions is one of my favorite collections of recent years, which made this news especially meaningful. “Rendering the Pose” is the longest poem I have written, and I worked on it (on and off) for about five years. I look forward to sharing it come June when the poem is published alongside the winners of the fiction and non-fiction categories. 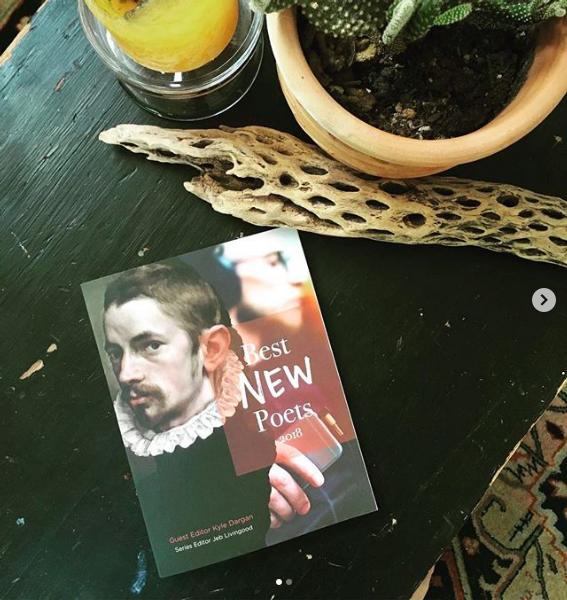 I am very honored to share that my poem, “Type Two” has been selected by Kyle Dargan for the 2018 edition of Best New Poets, just out from University of Virginia Press. The poem was originally published in Ruminate Magazine as a finalist for the 2018 Janet McCabe Poetry Prize. There are so many good poems in the anthology, and I am humbled to be in such great company. On Thursday, January 24th, I had the honor of reading as part of the Poetry Flash reading series at Moe’s Books to celebrate the publication of “Fire & Rain: Ecopoetry of California”, an anthology published at the end of 2018 by Scarlet Tanager Books. The anthology includes poetry legends like Gary Snyder, Brenda Hillman, Camille T. Dungy, Jane Hirshfield, Dana Gioia etc… as well as poems from many lesser known writers from around California, including my poem “Scavengers”. For the reading, I had the good fortune to read alongside Bay Area poets Tiffany Higgins, Jeanne Wagner, and Lucille Lang Day, who is also one of the editors of the anthology. I have great respect and admiration for Joyce Jenkins and Richard Silberg, who have run the Poetry Flash reading series since 1986, and are two of the kindest, most encouraging people I have met in the poetry community. My poem, “The Woodpecker’s Tongue” was recently published in Waccamaw, a journal based at Coastal Carolina University. The poem was inspired by listening to a radio interview with the author Walter Isaacson who wrote a biography of Leonardo da Vinci. In the interview, Isaacson describes some of the wonderful, strange fragments in DaVinci’s notebook, one of which was “Describe the woodpecker’s tongue”, which seemed like an excellent prompt for a poem. I am honored to share that the editors of Harpur Palate have selected my poem "The Hermitage at Laurel Dell" as the winner of the 2018 Milton Kessler Memorial Prize, which is named after the late poet and professor Milton Kessler. The poem imagines the life of a hermit, Emil Barth, who lived off the grid in a meadow on Mt. Tamalpais in California in the early part of the 20th century. Growing up, I frequently hiked past a place called "Barth's Retreat", the ruins of his dwelling, and was always intrigued by this enigmatic figure. Research revealed few details about his life. You can read the poem by clicking below. Today begins a month long residency at the Jentel Artist Residency program located near the town of Sheridan in Northern Wyoming. Along with five other artists, I will have the chance to take in the winter landscape and work on poems without interruption. I am very grateful to the Jentel staff and everyone who makes this residency possible --the gift of time and space is a truly a special thing! I am honored my poem "The Book of Indecision" has been included in Issue 15 of The American Poetry Journal. A special thank you to editors Theresa Senato Edwards and Hannah Craig, who have been so supportive of all the contributors to this issue. I am especially honored the poem has been nominated for a Pushcart Prize. For an interesting (and spirited!) debate about Pushcart Prize nominations, this blog post by John Fox, and the comments that follow are well worth a read. I am honored to have a poem, "Tejon Ranch Sonata: 2032" in Radar Poetry 15. Like every issue of Radar, this one is full of gorgeous poems paired with visual art. I am honored to be named a 2017 Artsmith Fellow alongside Peter Kline, Melissa Mathewson, Jennifer Moore and Krista Varela. I very much look forward to heading to the San Juan Islands in the beginning of 2017 to dive into a group of poems that have been looking for some time and space. I am looking forward to reading with this group of talented folks in downtown San Francisco as part of Litquake and the Yerba Buena Gardens Festival. My poem Foragers was recently featured in the journal Poecology, along with amazing work from poets such as Ellen Bass, Rajiv Mohabir and G.C. Waldrep. Here is a link to an excellent Editor's Note by Poecology editor and poet Kristi Moos.